Ok I know there are lots of people who say a raw donut will never be a true donut. Not the same texture, not the same taste. 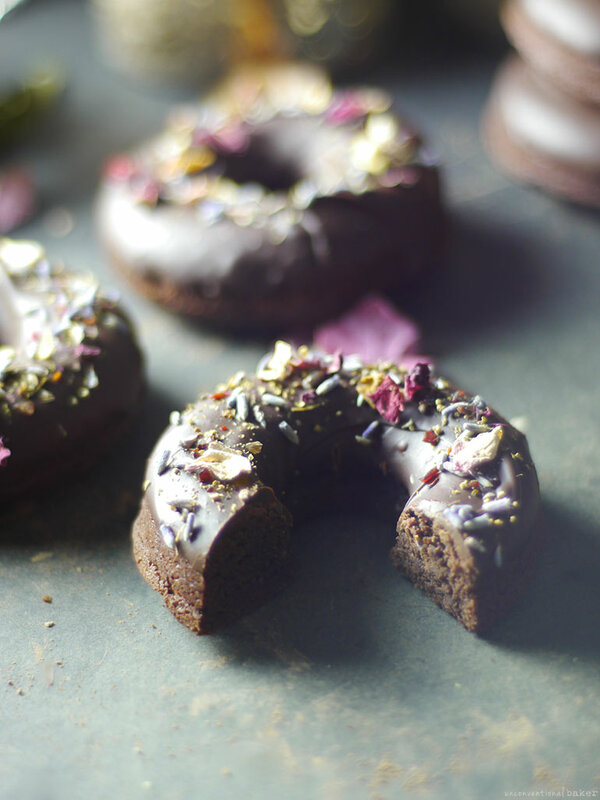 But these fudgey raw chocolate donuts are still a chocolate lover’s dream! I actually currently have very limited oven use (or more like use of a tiny oven that burns everything ? ), so went for a raw treat instead with these. They were fun to assemble, not at all fussy, but very, very chocolatey and delicious. 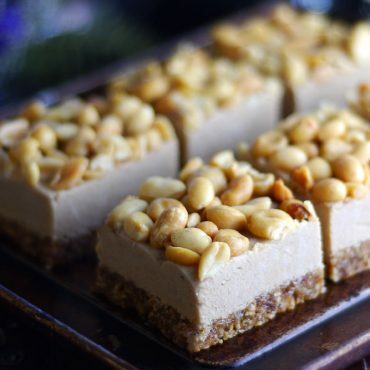 You can also use any other nut meal if you prefer — cashew meal works well (makes them sweeter), hazelnuts give a strong hazelnutty flavor (❤️), brazil nuts, etc. or sunflower seeds for a nut-free option. P.S. the recipe below is just for 2 large donuts, so multiply the recipe as needed to make more if you like. I used a large donut pan so ended up with two, but could only realistically manage ½ of one at most in one sitting — if I had my way, I’d def make more smaller ones if I had a smaller silicone mold on hand, but gotta work with what ya have, so I just cut mine into smaller portions. 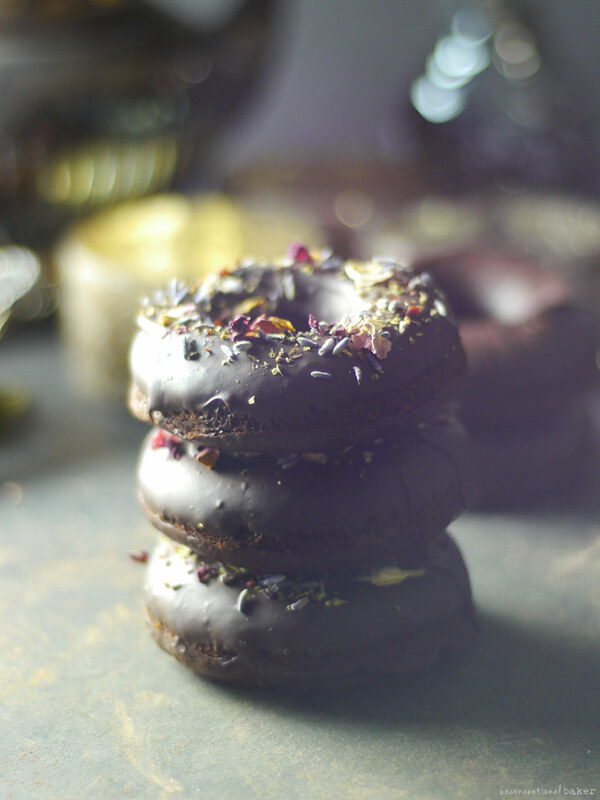 Super chocolatey raw vegan donuts that don’t require baking! 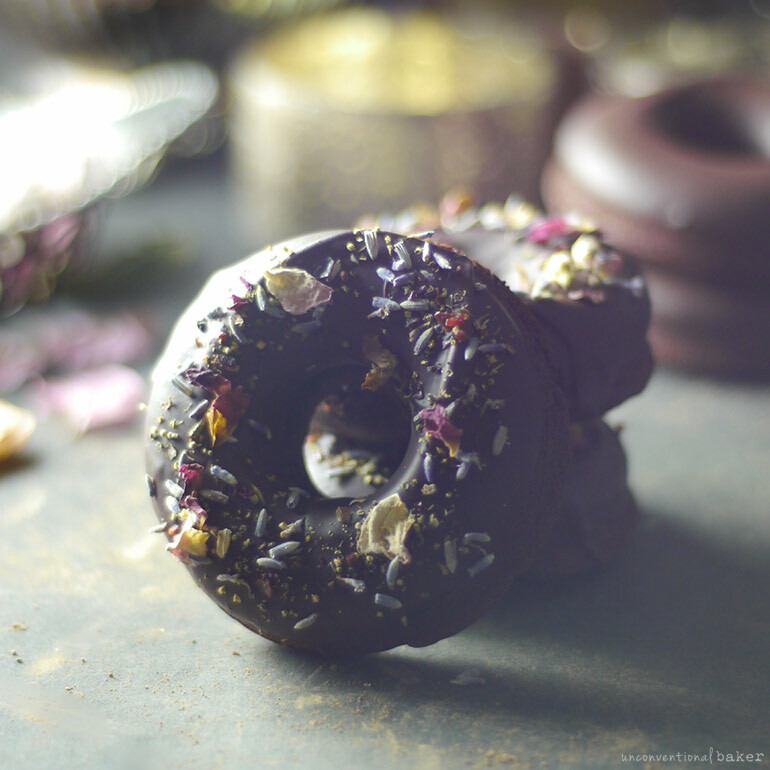 Toss ingredients into food processor and shape using donut mold. 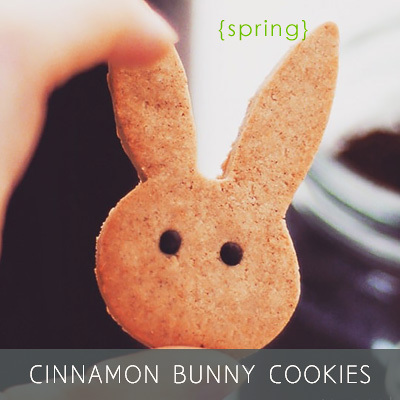 Fun, delicious, gluten-free! Process all donut ingredients in a food processor into a uniform mixture. Divide this mixture between 4 silicone donut mold cavities and press into the shape of a donut. Freeze for 1 hour (or longer) to set. Prepare the glaze by mixing the glaze ingredients together. Make sure the glaze mixture isn’t too hot, otherwise allow it to cool off a little. 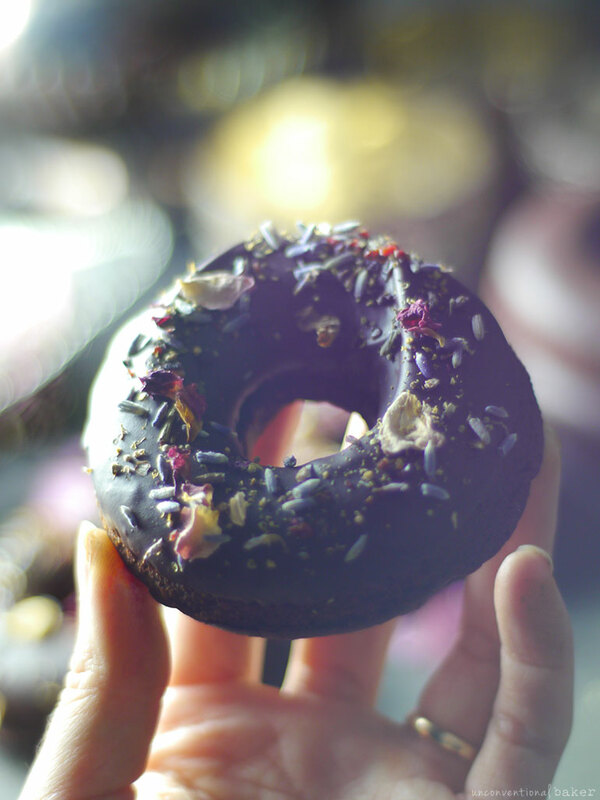 Unmold the donuts carefully and dunk each donut into the glaze mixture to coat, then set on a piece of parchment paper, immediately sprinkle with flowers or other toppings (if using). Return to the freezer to set for another 20 mins or so and enjoy! Keep leftover donuts frozen or refrigerated until further use. *the dates need to be pre-soaked to be very soft and hydrated. To soak, place in a glass bowl and cover in warm water and let stand for about an hour. For a quick soak (not raw) cover in freshly boiled water and let soak for 15 mins. Then strain the water and only use the dates for the recipe. **for the coconut cream, use only the solid white part at the top of a can that’s been chilled overnight. This post contains affiliate links to the silicone molds, dried rose petals, and lavender used in recipe. Hi Cassandra, I’m so happy these worked well as a baseline for you :) Thanks for sharing! Hi Blanca, for this recipe I used regular dates (deglet nour). Most varieties should work though. Medjool is a variety that tends to be quite moist naturally, so if you use them here instead only soak them lightly. I am just wondering if you can suggest a replacement for the almond flour. I have a son that is allergic to all nuts. You can try using oats (if those are ok). I especially like to use instant oats for something like this as they blend down finer. You can also use shredded coconut with a bit of coconut flour (only a bit though, as too much will dry out the batter). I haven’t tried this particular recipe with these substitutes, so it would be a matter of experimenting in terms of the quantities of things. 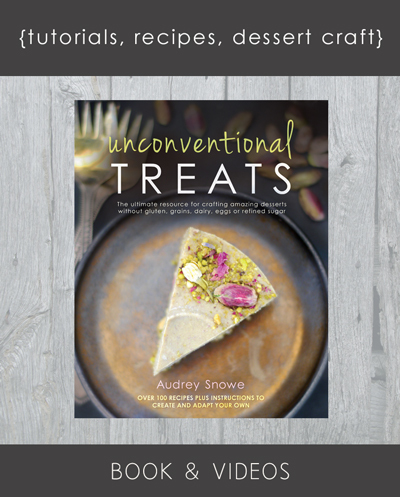 Alternatively, you could use this recipe for the bottom part (it’s coconut-based): https://www.unconventionalbaker.com/recipes/no-bake-brownie-bites/ — I’d probably go with that personally as a simpler solution. 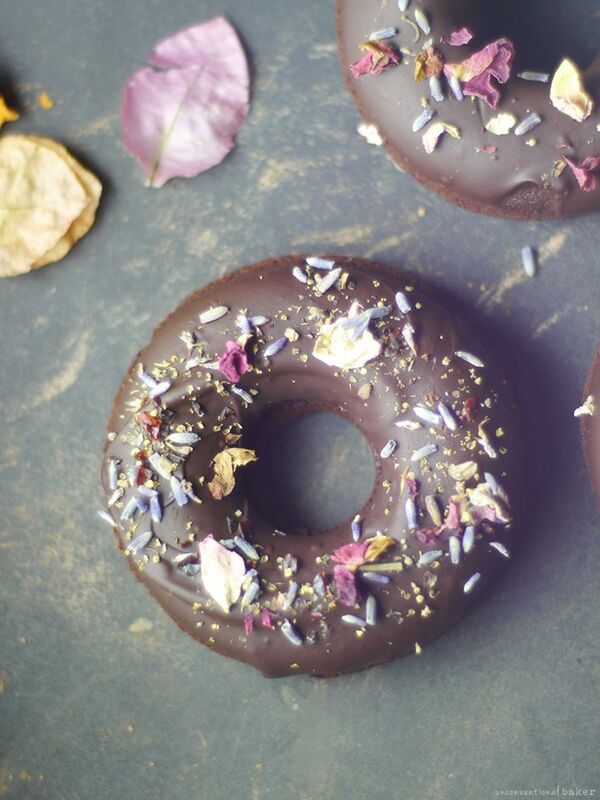 You’ll need to add in 1-2 tbsp coconut oil so that they hold the donut shape though. 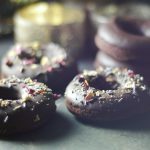 Basically follow the brownie bites recipe with the addition of coconut oil, press the batter into a silicone donut pan and freeze for about an hour so they set, then glaze. The pics are so beautiful, Audrey! What?! Too good to be true!!!!! Have you tried this with a flour like coconut? Just wondering if the texture from a nut flour is crucial to the texture. But if you take a coconutty recipe like this one: https://www.unconventionalbaker.com/recipes/blueberry-coconut-bliss-balls-recipe/ and add a bit of coconut oil to it to help it hold together I think you’ll be in business :) (there’s a chocolate version on the blog as well). Well those donut dissenters are wrong, this is DEFINITELY a donut! Honestly from here and with that silky glaze covering the top you could’ve fooled me into thinking they were baked up until I saw the ingredient list. You current kitchen situation certainly sounds…interesting right now. 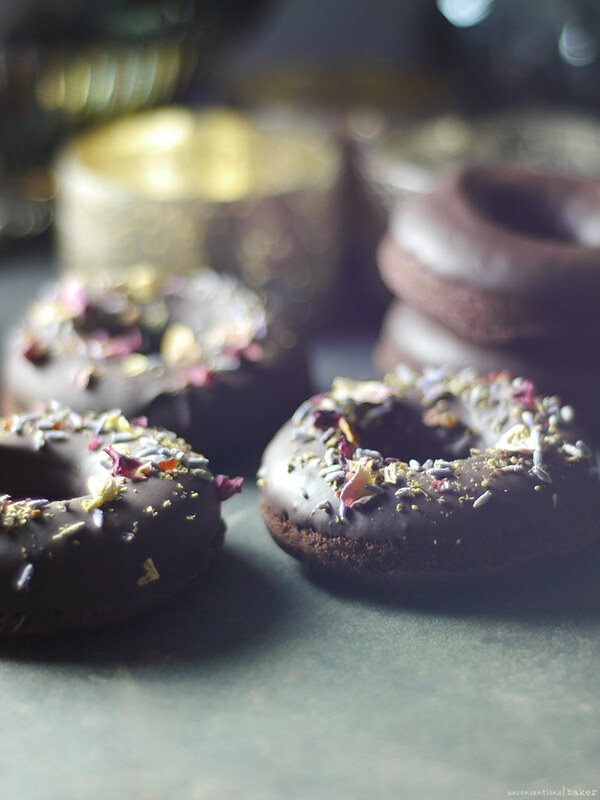 But you know what they say, tiny annoying ovens are the mother of no-bake dessert invention…or something like that :) I have made raw chocolate fudgy things in many shapes (although not donut yet) but I usually use oats and dates as the base. However almond meal + dates sounds 10 times more (no other word is as appropriate, sorry) moist and yummy! Have you found anything I could substitute for dates? 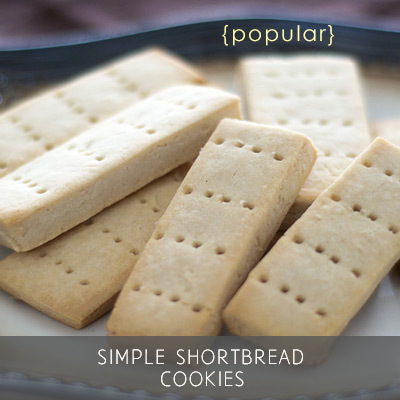 I seem to see them in most of your recipes for sweetener, but truthfully, I am not totally fond of them. Can you suggest something else I might try? Applesauce? (or is that too wet?) any fresh fruit? Cocoanut sugar plus something? Or do I need to experiment myself? I do use dates a good bit, but not so much as a sweetener. I just like the texture and binding quality they bring to certain recipes. The sweetenes is a bonus in a way. 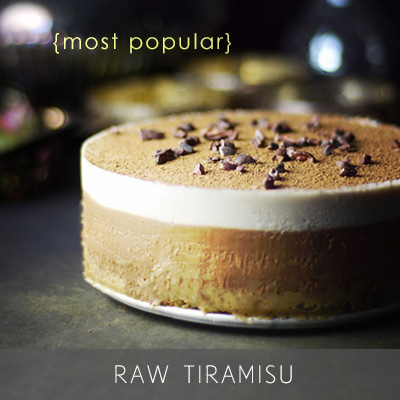 In terms of most recipes on the blog, when dates are used sparingly in a crust for raw cakes and such, you can just omit them and add a hint more sweetener and coconut oil and you’re good to go. For things where they matter more for texture though (like here, or in the ice creams and so on) it’s a bit of a different story. They’d need to be substituted with some other form of dried fruit, and the next best match I find is dried figs. Raisins are ok too in some cases. Applesauce would be too wet, and not sticky and sweet enough. Same for fresh fruit. 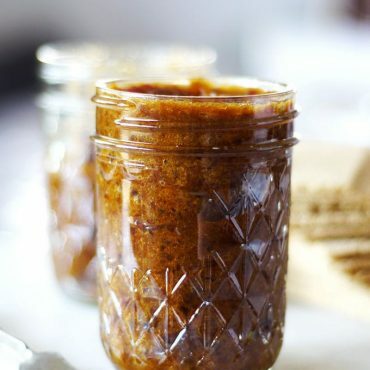 You could experiment with coconut sugar and a bunch more coconut oil to hold it together — I haven’t tried, but something like that would probably work fine if you hit the right proportions. A mix of some fruit jam + coconut sugar + a bit more coconut oil could work too. When in doubt, ask for a date substitute on specific recipes and I’d be happy to chime in and see if there are alternatives, as it’s hard to offer a blanket substitution on all recipes since the dates serve different purposes in each one — sometimes essential and sometimes totally replaceable.